The Treasures of the Civil War: Timed Online Auction features a diverse assortment of exciting Civil War material consisting of documents, broadsides, textiles, folk art, early photography, and more from the era. 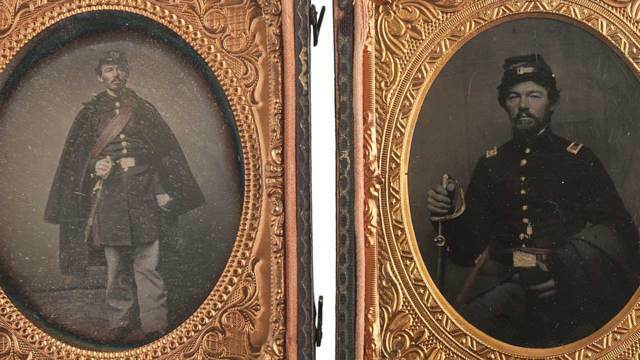 Highlights from the photography section of the auction include Slaves from New Orleans, Pair of CDVs Featuring Wilson Chinn, Rebecca, and Others, offered as Lot 3; a CDV of Johnny Clem, Drummer Boy of Chickamauga, offered as Lot 57; and a Rare Signed CDV of Confederate States Navy Captain Arthur Sinclair III, offered as Lot 89. Other important highlights include a collection of 39th USCT Muster Rolls, 31 Aug. - 31 Oct. 1864, offered as Lot 141; a Letter Archive of Josiah J. Brown, 2nd & 15th New Jersey Vol. Infantry, POW, WIA, offered as Lot 136; and a Folk Art Carved Civil War Pipe With a Decorated Band Inscribed Libby Prison 1863, offered as Lot 201.